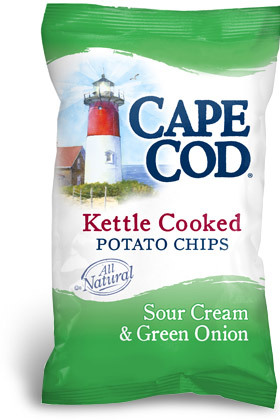 Cape Cod are one of the few Chips manufacturers that can get away with such a dominant logo on their bags because it looks as much like artwork you would include on the wall after a wonderful vacation at the Cape, as it does the World's Favourite Snack Food packaging. A good Kettle Cooked Chip is all about the crack and snap of a firm, thick Chip. This was as crunchy as you could hope for in a flavor filled Chip and the Snap Test was as good as any. The Canola Oil that these were cooked in not only gives the impression of a healthier snack, but it makes them a little less greasy than regular Chips. The Kettle Cooked nature of the Chips saw some curly examples but most were flattish with small bubbles. The powdery parsley flecked residue was mixed well with the oil so fingers didn't get too mucky. These feature a more creamy onion flavor that the description on the bag would suggest. You don't get much of an onion hit, but what is there is sweetened by the cream. The All Natural claim is stretched a little by the hubble bubble potful of powders and natural additives, but it is still a very good example of the flavor.